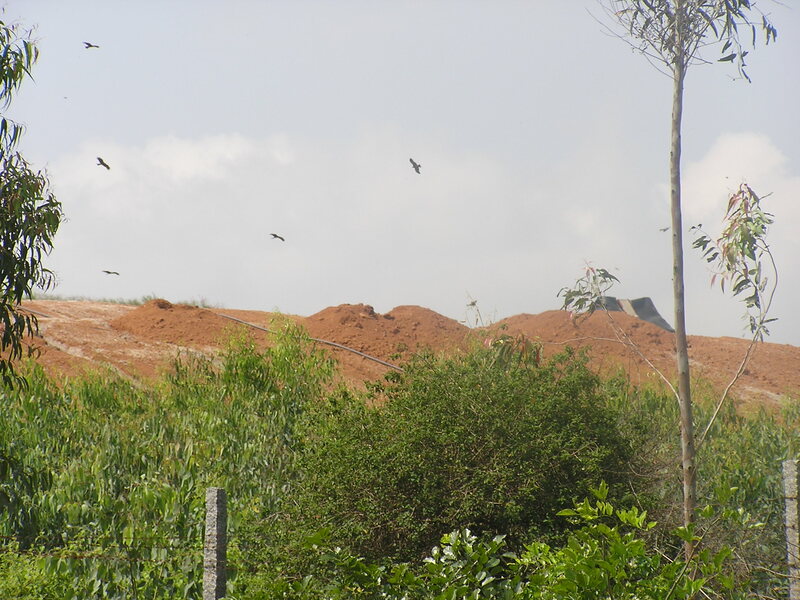 Landfill covered with a layer of soil. The leachate from these mounds enters an open tank located at the entrance of the facility. With the talk of Mavallipura landfill “revival” rending the air, I thought it was high time I visited the landfill and studied what it takes to compost biodegradable waste from 300 tonnes of mixed garbage per day which includes all possible kinds of hazardous waste. 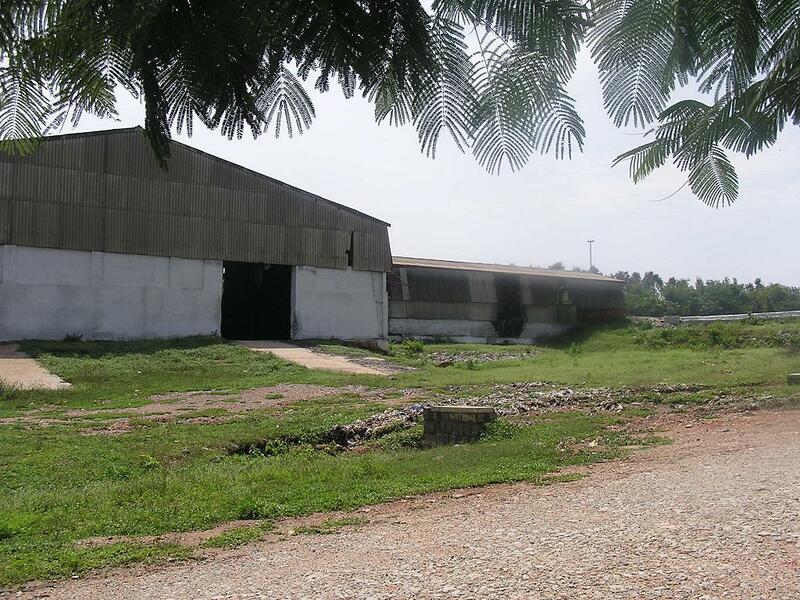 As you already know, the state government is planning to reopen the site that was in operation from 2002 to July 2012. It was shut down followed by massive protests by the residents of Mavallipura and many other surrounding villages and activists from Environment Support Group. Ramky’s SWM landfill that was shut down two years ago is all set to be opened soon. A new firm has taken overs its operations. As I drove up the landfill on the rutted road, it seemed as though yesterday’s pounding rains had lent the surrounding vegetation an enchanting lush-green look. Everything seemed normal. Whatever that means. With some difficulty, I made my way into the Ramky SWM landfill processing unit which has gone silent for two years. The unit is now taken over by Green and Clean Solutions. A funereal gloom hung high, aptly complemented by crows and vultures hovering over the landfill. It looked like a ghost town from afar with some human-like apparitions trying to spruce it up for the reopening ceremony by painting the machines and the weighbridge. Right next to it, within a few metres of distance, mounds and mounds of landfilled area lay covered with a layer of soil and it looked like a neat mud hill from a distance. The leachate that seeps down gets collected in an open tank. According to Santhosh of Mavallipura, what we saw was diluted leachate, thanks to the heavy rains. 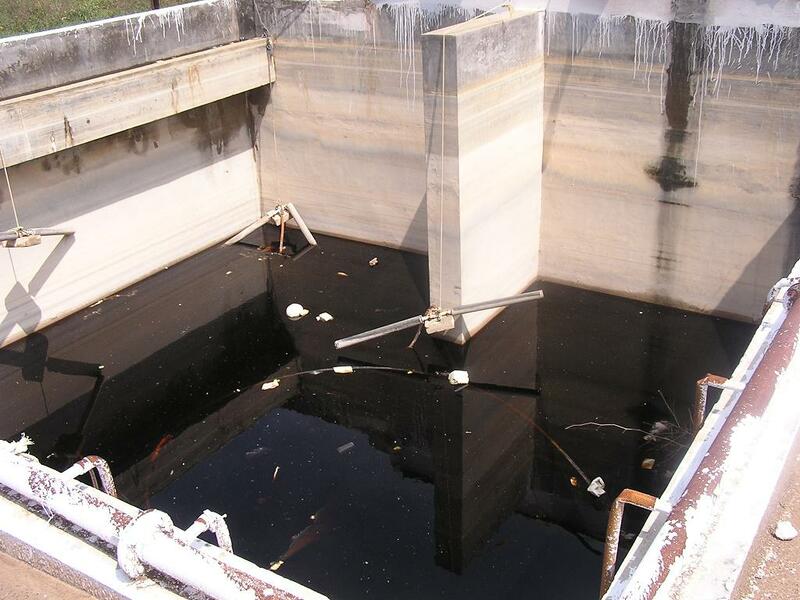 There was one more tank where the collected leachate has been lying untreated for two years. It’s black. Murali and Sharath of Green & Clean claimed that it’s a well-concreted bottom, foregrounding any questions on possible seepage into the groundwater. This extremely hazardous leachate has been lying in this tank for over two years at Mavallipura Ramky SWM landfill. ‘Solar evaporation’ is the process it has been subjected to. The duo also claimed that nearly 1.5 feet of soil has been laid and beneath it is another layer of gravel. “But ideally, it should have been compacted by bulldozing.” In their view, this measure could have prevented rainwater from entering the piles easily. The curiosity that led me here was simple: How on earth could mixed garbage, which is already dripping wet with harmful leachate, be turned into compost? An interaction with the staff revealed this much about the future: The firm will receive only 300 tonnes of waste and run it through an auto-claving or sorting machine which will throw out rejects or inerts. It will then be run through another array of machines where further sorting happens and eventually, only compostable garbage will be taken out. Once that is done, this ‘biodegradable’ waste will be spread on a sloped, concreted strip. But the leachate that keeps on dripping down the slope will get collected in tanks. Later, this leachate will be diluted with normal water and then sprinkled on the composting bed to keep it moist. The same will be sold as manure to farmers around. First of all, everything that rots is not compost. Composting involves breaking down of the organic matter in a conducive environment. What is being planned here is aerobic composting. But when biodegradable waste gets mixed with hazardous waste, putrefaction sets in due to lack of oxygen. Formation of greenhouse gases including methane and other noxious gases goes on unhindered. This is not composting. This is rotting under the worst possible conditions. One of the parts of the landfill which is yet to get a layer of soil cover. 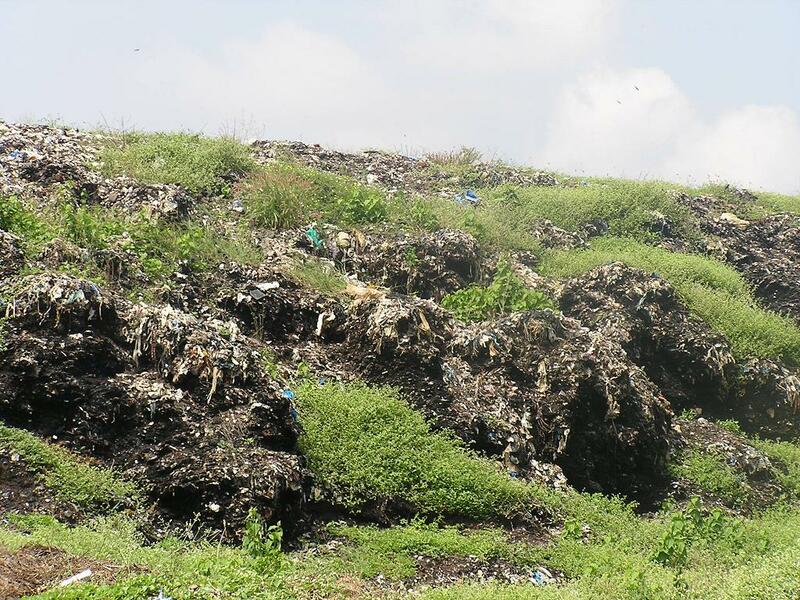 According to a source, at least 40 lakh tonnes of such waste is lying in this 80-foot-deep landfill dumped over 10 years. Moreover, it would be quite an achievement to sort only compostable waste out of this lot. Still, even if we are ready to trust that such a thing is possible, we can take it for granted that this green waste is already laden with harmful leachate seeping out of the hazardous waste during loading and transporting. On top of it, the process involves sprinkling of the same leachate back to the bed. This is where willing suspension of disbelief must set in if you want to go on living in self-denial. Because any food produce grown using this ‘compost’ will enter the market and sit snugly in zip-locked bags in your perfectly moisture-controlled fridge. This entry was posted in Endlessly Green and tagged Landfill leachate, Mavallipura landfill, Ramky SWM landfill, Solid waste management, water contamination at Mavallipura. Bookmark the permalink. Yes, Mr Satyapal. But that does not solve the problem, If not this landfill, some other will open up or dumping at Mandur will continue. The question is how we design a system that does not involve landfilling. May be instead of broom campaign if pm narendra modi had made segregation of waste compulsory things would have become much easier. Telling everyone to do it without legislation is very difficult. You said it right, Dr Sowmya. Segregation at source is the only way to mitigate landfill crisis. Sweeping alone doesn’t take us anywhere. Our pourakarmikas have been doing it for decades. This national-level campaign needs to head in the right direction. As far Karnataka, we do have 2012 legislation which made segregation at source mandatory. But its implementation has suffered terribly. What could be the immediate and right solution to protect environment, pollution effecting the villagers and vulnerability to flight safety? First of all, the reopening must be stopped. But that would mean encouraging dumping in Mandur beyond December. There are no quick-fixes as the quantity we are talking about is 40 lakh tonnes. It’s HUGE and will takes years before it is scientifically disposed of. In fact, I do not even know if even the most modern technology can help tackle this hell without considerable damage to the environment and people around. But efforts must begin somewhere to decontaminate the polluted land and the spreading of the leachate to surrounding areas.